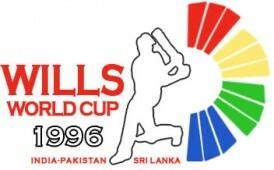 India was expected to do well in the Wills World cup ’96. Never before was there such euphoria for any event. Not that I knew of. I remember that advertisement in which Mongia, Kambli and two other Indian cricketers used their four-square bats to win the boating race against boats loaded with the pro-Mallus. That was the time that I started watching cricket closely, (although I do remember waking up on one early morning in the ?92 world cup to watch Srikanth caught on the boundary off the bowling of Deepak Patel). And so the world cup began, with New Zealand defeating England. The highlight? Well, do I need even say that? It was the quarter final match against Pakistan. In a high-voltage encounter, and probably the most-watched cricket match to date, India defeated Pakistan by 39 runs. No Indian fan can forget the penultimate over bowled by Waqar when he was carted all over the park by Ajay Jadeja at the Chinnaswamy Stadium. And the Prasad-Sohail incident still brings goose bumps to us Indians. For all the runs Sachin, Ganguly and Dravid have scored over the years, if you ask an Indian to pick one incident in Cricket, this would be it. India went out in the semi-finals in controversial circumstances at the Eden Gardens in Kolkata. Sachin (with 523 runs) and Kumble (with 15 wickets) were the stand-out performers for India. But it was Jayasuriya, De Silva and co. who had the last laugh as they beat Australia in the final at Lahore. The story for the next five years for India was pretty much “Tigers at home and dead-meat abroad”. India toured England immediately after the world cup. The English bowlers had India in trouble straight away on a cold morning at Edgebaston. India folded out for around 220. England rode more on Nasser Hussain?s luck than his century (after their top-order was dismantled by Srinath and Prasad) to make 350. Then came a classic from Tendulkar. While India continued to lose wickets on the other end, Sachin counter-punched and reached his century with a lofted six off the left-arm spinner Min Patel. Running out of partners, Sachin took one risk too many and was the ninth man out with India barely crossing 200. India folded out quickly and England knocked off the hundred odd runs with ease. The dressing room had a sense of unsettled look about it. Siddhu had earlier left the tour following a tete-a-tete with Azhar. India went into the 2nd test at Lords with what looked a very inexperienced line-up, fielding two debutants (Ganguly and Dravid). Most Indian fans know what happened then. Ganguly scored 130 and Dravid was just five short of his hundred when he was caught down the leg-side as India made a score of around 350. This, after a Chris Lewis beauty had beaten Tendulkar?s bat to take out the off-stump. Jack Russell and Graham Thorpe frustrated the crap out of the Indians after their top-order was taken care off by Srinath and Prasad yet again. England went past the Indian total and eventually bowled out. The match ended in a draw. The third test was a batting paradise and the match petered out into a draw again. India lost the series 1-0. India beat SA on the slow-low turners at Ahmadabad and Kanpur. Azhar was the star of the series, with two centuries, one in Calcutta and one in Kanpur. The three-pronged spin attack lead by Kumble and ably supported by Srinath were too hot to handle for SA and India went on to win the series 2-1. Before this, India had won the one-off test against Australia (thanks to a century from Mongia) and also the Titan cup beating SA in the final, who had won all the round-robin matches. How naive were we! My friends and I believed that we became world-beaters all of a sudden. After all we had beaten Australia and South Africa in tests and ODIs. And when India bowled out SA for 235 at Durban on the first day the belief got stronger. Then came the shock. India was bowled out for a round 100. Dravid was the only batsman who showed some resistance. The rest capitulated. Vikram Rathore’s failure was understandable but how could Sachin, Azhar fail? It was really hard to believe but we thought that this was just an off-day for the Indian batters. In the second innings, Srinath and Prasad got to work again and reduced SA to 193/9. But the last wicket partnership of 60 odd runs between Donald and Mcmillan meant India had to chase over 400 to win. Was gettable? Just see-off the new-ball and the ?formidable? middle order will take care of the rest. “Let?s do it session by session” aired Sunny Gavaskar. But Donald and co. needed only one session and India was blitzed, bowled out for 66, Dravid stranded on 29 not out. Then for the first time I realized, ?home and away?, ?slow-low tracks at home and bouncy pitches abroad.? Then I told myself. ?Hell No! We had an off test match. We will be back in the next.? The story was similar in the next. This time Azhar and Sachin scored centuries though. I also remember that one-handed catch of Adam Bacher at deep square leg to dismiss Sachin. And then, I heard the commentators talking about how the SAfrican fielding is superior to the Indian fielding. Apart from batting and fielding, another major problem during this period was the third seamer and inability of Kumble to pick wickets on pitches abroad. Srinath and Prasad would reduce the opposition to 30/3 so often. Only for David Johnson/ Dodda Ganesh/ Abey Kuruvilla/Paras Mhambhrey/ Debashish Mohanty/ Thiru Kumaran/ Salil Ankola/ Robin Singh Jr./ Agarkar to come in and leak easy runs. Kumble would try hard. He would bottle one end up but he was not very threatening in terms of ability to pick wickets. India played much better in the 3rd test and but for the weather and a stubborn Cullinan India would have won the third test. But that was not to be and India lost the series 2-0. India then went on to lose the ODI series (3rd team being Zimbabwe). What this also said was lack of planning by Indian selectors. India should have ideally play the ODIs first, then go into a three-day match and then into the test series. But, in this case, India went into Durban in the first test, which has the fastest pitch in the world after WACA. By the time the players got used to the conditions in South Africa, the test series was already over. Just like the series in England earlier that year. India then toured the Windies. The Windies were on a downward trend. And we ?almost? beat SA in the third test. So, technically we were the favorites. That?s what I thought! Had Srinath played, maybe I could have been right. But, that was not to be. India fell short, chasing 120, at Barbados, and this was the first time I heard Tony Cozier’s voice and I go to know that he was Mr. West Indies. India’s reputation of being “nice and gentle” in away test matches grew. Then we had a much needed home tournament to get the confidence of our players back. In the Independence cup at home a “new concept” was tried out by the BCCI with the day-night matches starting at five in the evening. India beat New Zealand, but lost to Sri Lanka and Pakistan and did not even make it to the final. This was followed by a drab test series against Sri Lanka, with the pitch (and not the batsmen or the bowlers) deciding the fate of the matches. India declared at 537/8. Sri Lanka replied with a record 952/6. Mahanama (215) and Jayasuriya (340) made merry while Rajesh Chauhan, Kumble and Nilesh Kulkarni toiled. Chauhan ended up conceding 278 runs, the maximum by a bowler in a test match. The pitch for the second test was a tad better but the test meandered to a draw. India then played Sri Lanka at home and the result was the same 0-0. The honors were shared in the ODIs too. After a ?feast? of drab, boring India-Sri Lanka matches, India went to Dhaka to play the Independence Cup. Sachin was relieved of captaincy duties and Azha was restored at the helm. Sachin duly obliged the fans with a rollicking 67 off 44 in the shortened match against Pakistan. The Indian fans were ecstatic and relieved at the same to see the ?Sachin they knew?. India dominated the league matches and won the first final, thanks to Sachin?s 95. The Bangabandhu Stadium at Dhaka was witness to some gorgeous stroke play and saw the revival of Sachin. In the second final though, Azhar Mahmood bowled Sachin for five. India then struggled and reached 190. Afridi, Anwar and co. had no problems dispatching the meager total and the momentum suddenly took a major swing towards the men in Green. In the third final, under overcast conditions and gloomy skies Azhar put Pakistan in. India got Afridi and Sohail early. It then started to go horribly wrong for the Indians. Pakistan reached 314 in 48 overs, as Ijaz Ahmed and Saeed Anwar scored hundreds. Rahul Saghvi was hit for one of the biggest sixes I have seen to date by Saeed Anwar en route to yet another century against India. The skies were still gloomy and so was the situation for India. Tendulkar and Ganguly started slow reaching ten in three overs. Then came the over from Aaquib Javed to Sachin that kick-started India?s retort to Pakistan?s mammoth total. Indian reached 71 in 8 overs as Sachin lofted Saqlain over the sight-screen. But, when Afridi got Sachin skying one down the throat of mid-off, I have a feeling that some TVs must have been broken, others switched off. But, Ganguly(124) and Robin Singh(84) took charge and took India to touching distance. The light went really dark and the floodlights of the football stadium nearby were used to complete this Day match. India started losing wickets in a pile and nine were needed of the last over. Kanitkar and Srinath rode their luck and brought the equation down to three off two balls. When Kanitkar lofted Saqlain, over mid-wicket for a boundary, the entire nation erupted in unison. Amazing Analysis. I am very proud that India has been having great talent which gets better every year. I think it is time they win the World Cup with Sachin at his best!!! ODIs – One Dimensional Internationals?